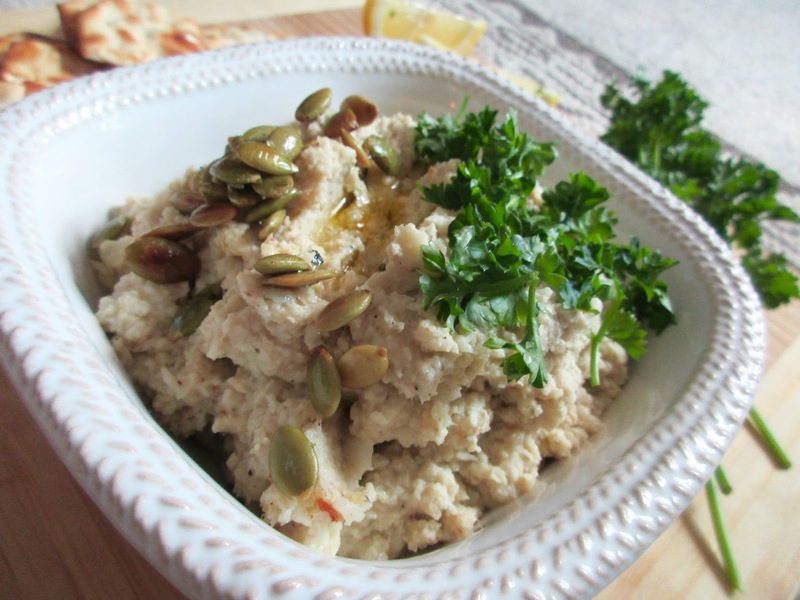 This Roasted Cauliflower and Garlic Dip. A lovely, rich, transportable, picturesque display of an appetizer that does Passover well—and if you can nail the travel, unrefrigeration, and chametz restrictions of this fine holiday, you can do anything. What I like so much about this dip applies to my Butternut Squash & Tahini Spread as well—it has that sensationally creamy texture so essential to the condiment's namesake, plus interesting, fresh flavors that one just cannot create with an off-the-shelf hummus. (I love hummus as much as the next person, but does anything say "I tried" less?) Here, richness has depth from earthy cauliflower, deeply roasted garlic and toasted pepitas, made sprightly with bright lemon and sweet nutmeg. A generous glug of good quality olive oil ensures a grassy, golden finish. Finally, the bowl is topped with verdant parsley dice and whole pepitas, adding aesthetic flare to the modest-looking dip. If laying the bowl on a board, consider adding whole parsley sprigs and lemon quarters to up the visual ante even more. For Passover, serve the Roasted Cauliflower and Garlic Dip with veggie sticks and Tam Tam crackers (I will point out here that the fiber-rich cauliflower will help with some of the digestive hold-ups, if you will, of an 8-day matzoh diet). 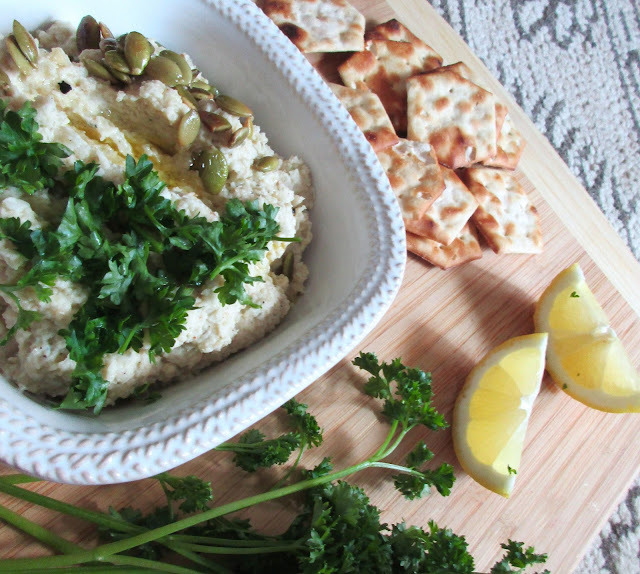 If making the dip any other day, accompany with toasted pita wedges or flatbread. 2. In a medium-sized bowl, toss cauliflower florets and garlic cloves (still in their papery skin) with 1 tbsp olive oil. Spread on a rimmed baking sheet. Sprinkle generously with sea salt. Make sure garlic is tucked up against the cauliflower florets to protect it from the heat. 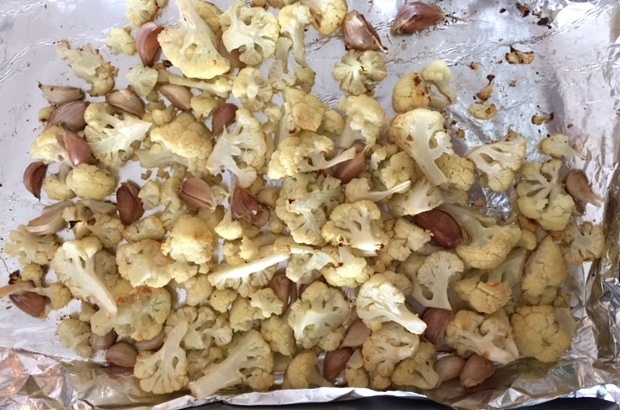 Flipping halfway through, roast until cauliflower is tender and golden, about 20-25 minutes. Set aside to cool. 3. Meanwhile, set a small skillet over medium heat. Add 1 teaspoon olive oil, then the pepitas. Toast 2-3 minutes, just until the seeds become fragrant and a few start to pop. Toss with sea salt and set aside. 4. When cool enough to handle, squeeze roasted garlic out of the papery skins. 5. In the bowl of a food processor, pulse to combine roasted cauliflower and garlic, 2 tablespoons toasted pepitas, lemon juice, nutmeg and cayenne pepper to taste. With food processor running, drizzle in 3 tablespoons olive oil (for a creamier dip, add up to 2 more tablespoons olive oil). Taste and add additional sea salt, cayenne and lemon juice as needed. 6. Spoon dip into a wide bowl, drizzle with remaining teaspoon olive oil, minced parsley and remaining toasted pepitas. 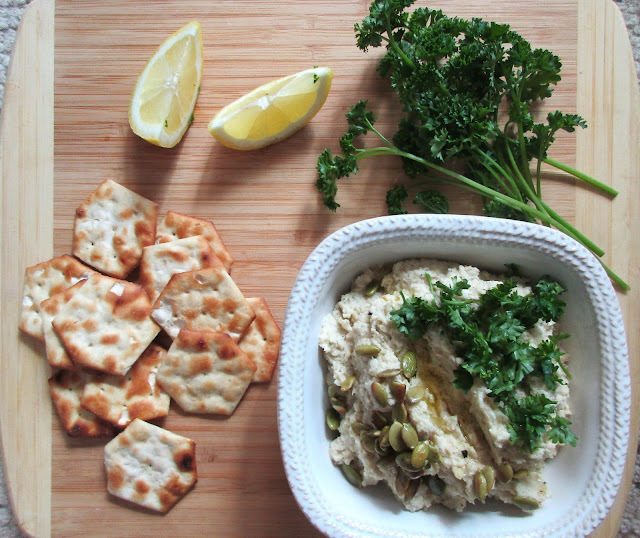 Serve with warm flatbread triangles, crackers, or raw veggie sticks.